File Photo Notre Dame faces their toughest test so far this season on Saturday vs. #4 Waynesville. 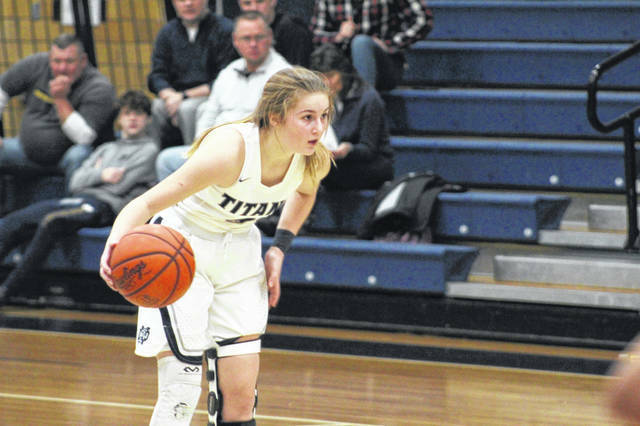 IRONTON – Saturday will feature one of the biggest single day events for high school girls’ basketball in our area and will give three Scioto County teams a stiff challenge before the final week of regular season play beginning Monday. Ironton High School will host the Tackett’s Body Shop Shootout hosted by the Ironton High School girls’ basketball program, an event that will feature the Wheelersburg Pirates, the Minford Falcons, and the Notre Dame Titans in back to back to back games. To kick things off on Saturday at 11:00 a.m., the undefeated #5 Vinton County Vikings will face one of the 16th region’s (KY) perineal powerhouse schools in the Ashland Paul Blazer Kittens. Following the conclusion of the opening game, the Wheelersburg Pirates will square off against another top team in the 16th region, the West Carter Comets. Allie Stone has been the main source of the Comets scoring through the majority of the regular season. The talented freshman has already eclipsed the 1,000th point mark since she began playing her freshman year. Two of the Comets talented seniors, Morgan Berry and Hannah Bear will also be players to watch in order for the Pirates to pick up a non-conference win heading into tournament play. The defending SOC II champion Minford Falcons will tip things off against yet another 16th region powerhouse, the Russell Red Devils. Russell will be without Aubrey Hill, arguably their best player, in their matchup with the Falcons. The matchup to watch on Saturday between these two talented teams? Lakie Sanders vs. Ashley Blankenship in the post. If the Falcons can control the paint and hit their open shots, they’ll be primed for a big win over a talented Russell team. Scioto County’s final representative in what may be the marquee game Saturday’s event will be the undefeated #7 in Division IV Notre Dame Titans, who have played incredible basketball through this point in the season, facing off against the undefeated #4 in Division III Waynesville. Waynesville currently sits at 15-0 and received one first place vote in the most recent AP poll released late Tuesday evening. To end Saturday’s event, Ironton will play host to Franklin, and Tecumseh will face off against the Parkersburg Big Reds (Wv.). If you’re not busy or have an itch to go and watch some elite level high school girls basketball, head to Ironton and watch some of the area’s best do battle in what should be a fun day of games.